Bigleaf unlocks the hidden data on the WAN path from your business to the Cloud. You gain access to real-time and historical data from our SD-WAN software that monitors each of your Internet connections 10 times per second. This multi-tenant web dashboard provides customers, IT consultants, and Bigleaf partners visibility needed to troubleshoot WAN or Internet issues, evaluate bandwidth/speed adjustments, and understand the impact of network performance on application experience. 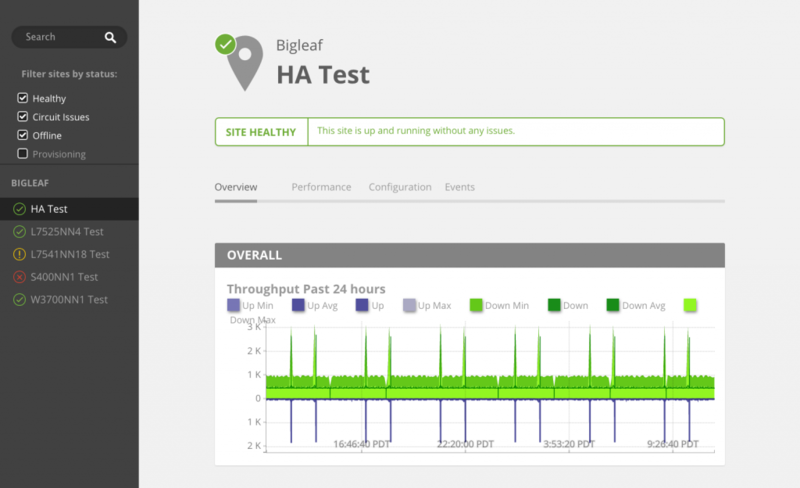 This data includes statistics, graphs, and events about the performance of Bigleaf services and ISP connections. 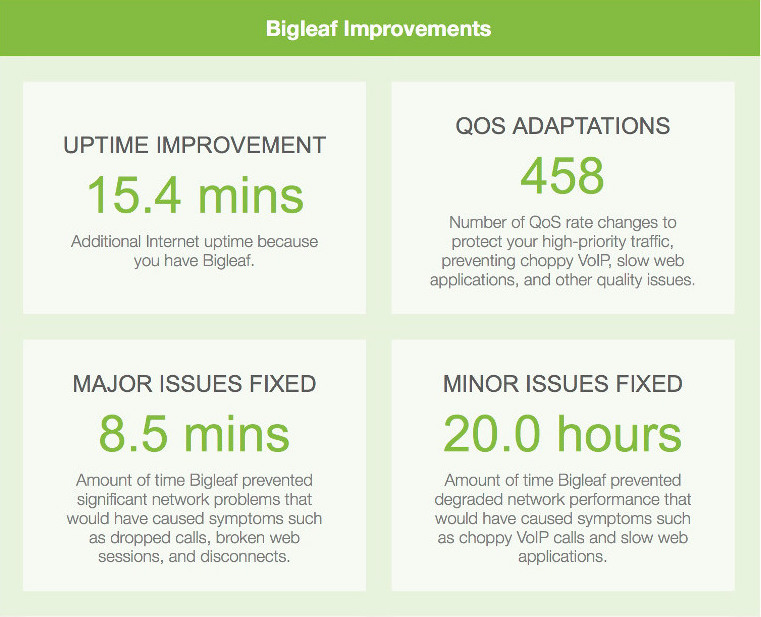 Performance reports provide a simple executive-summary view of the benefits of Bigleaf’s service, and the performance of each ISP circuit at your business location(s). This data provides a clear view for business leaders, CIOs, and IT directors to understand the impact that Bigleaf’s Cloud-first SD-WAN service has on the business uptime and productivity. Do you want to know in real time if any of your Internet connections degrades in quality or has an outage? What about if a site goes down? 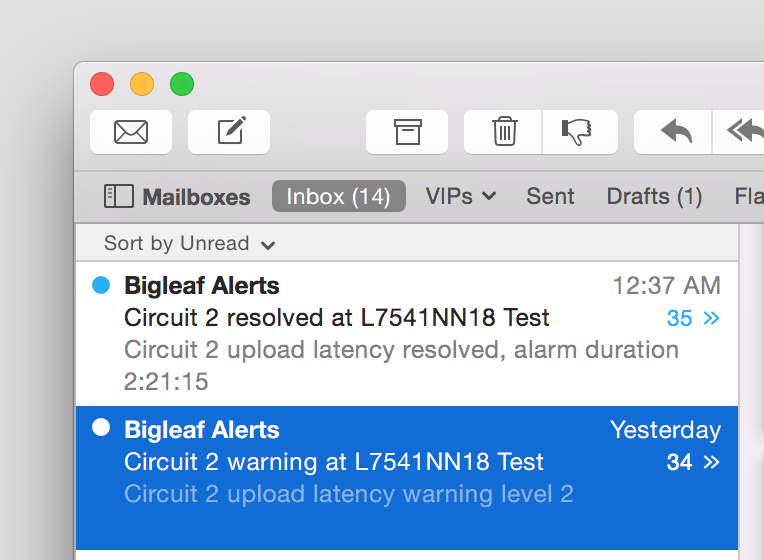 Bigleaf’s real-time email alerting provides constant awareness and is configurable based on issue severity and duration. Multiple accounts are supported for varied reporting to individuals, distribution groups, and text-messaging/paging email addresses.